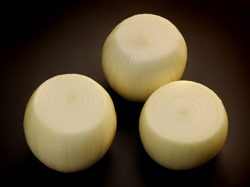 Fresh/Whole Peeled Onions - Boardman Foods Inc.
Sweet Spanish Onions provide a firm, succulent product that is ideal for use as a food ingredient. Upon entering the processing plant the onions are sized and peeled to custom specifications using the latest vegetable processing equipment. All processing is in accordance with good manufacturing practices. Between 2.5 and 4 inches or to customer specification. 50# case, 1700 # totes or packaging supplied by buyer.